The erosion of loyalty in the workplace is pervasive, especially among millennials. This is the result of organizations not providing ways for employees to see meaning and purpose in their role and in what they do. If properly addressed, the over-arching “brand” can become the galvanizing idea to express an underlying inter-connection of Vision, Mission and Values, and provide a focal point for developing pride and greater loyalty. This new lens is about understanding the importance of congruence and how to use it. As far back as 1968, various studies1 have concluded that the congruence between self-image and brand-image eventually plays an important role in improving brand loyalty. Today, the thinking about congruence and incongruence comes from Carl Rogers’ humanistic approach to psychology that suggests that humans want to experience and behave in ways that are consistent with their self-image and what they would like to be. 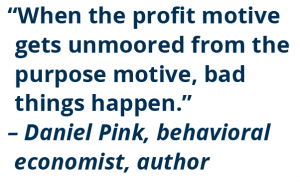 When examining what motivates us, it’s clear we are driven by intrinsic factors far more than extrinsic ones. Thus congruence, and how to shape it, is an under-lying key to engendering loyalty, which becomes a significant competitive advantage. 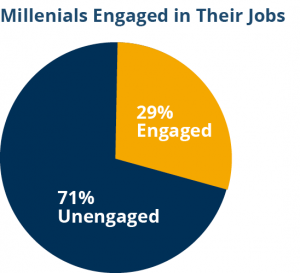 What we know from research is that 71% of millennials2 say they are not emotionally and behaviorally connected to their job or company. The days of organization and corporate loyalty have shifted dramatically, and continue to do so. 66% of millennials3 already say they plan to leave their jobs by 2020. In other words, they are already thinking about moving on and not staying to build a long-term career. This puts an enormous burden on organizations to figure out the underlying needs and re-frame themselves so that they can align and engage. There are many companies trying many different activities to retain and build loyalty, but many of these programs are simply band-aids and not fundamental cures. What is causing the shift? Acceleration of industry disruption. The rate of change is increasing. Technology has disrupted virtually every industry. Thomas Friedman writes eloquently about this in “Thank You for Being Late”, a text describing the tectonic shift in attitudes resulting from technology evolution. Mergers creating mixed cultures with little rationalization or explanation of “why”. As markets consolidate, mergers have created larger and larger organizations, where different cultures may not share a common view of the future, and the role they can play in it. Employees often feel unheard and unmanaged. Because of the rate of change, it is hard for companies to keep up with acknowledging individual needs. This dynamic can further distance employees at a time when they need more communication, not less. Corporate visions and missions are often generic and uninspiring. There are relatively few corporate visions and missions that are specific and unique to a company. Much of the time they use generic words instead of language that guides employees to feeling like they are part of something special. Corporate values can sound nice on paper, but are often not differentiating and compelling. When values start sounding generic, employees tune out as they do not feel any deep connection to the DNA of the company they have selected to work for. It’s about the specific values as well as the actions that support them such as compensation, incentives, training, advancement, etc. At the core of millennials’ concerns (and we believe a much broader swath of employees) is the need to have meaning and purpose. They want to be part of something that aligns with their beliefs, and has a culture that validates what they are doing. 87% of millennials4 seek something greater than themselves, such as participating in cause work. This is a dramatic shift from prior generations. The result is that to build and sustain a loyal workforce, organizations must establish congruence in the work place. The new mandate is that employees must truly believe what they do is viewed as part of what they would like to be. It is not enough to strive to be an organization that is the “best” at something, unless this is attached to a belief that reinforces purpose. In building a powerful brand, organizations need to think broadly about the narrative of Vision, Mission and Values. This is what, in total, creates congruence. Each element plays an important role in not only shaping the future, but building a community that employees want to be part of. Over the years, we have spent a lot of time guiding organizations to clarify and understand what each element is and the role it serves. We have found that stepping back and re-evaluating each element offers the opportunity for an organization to ask the hard questions about whether each is appropriate for the future the organization is facing. A tougher question is whether there is a consistent narrative that defines the organization, guides behaviors, and resonates with the changing needs of the emerging workforce. Vision describes what the organization aspires to be. 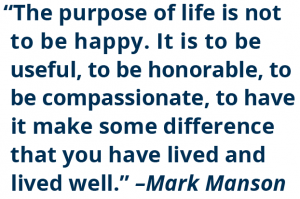 It is, ideally, expressed to communicate the better world an organization hopes to bring about. It must be inspirational and speak to all stakeholders. A powerful vision becomes an aspirational north star. Mission is what the organization must do to achieve its vision. It is the guidance of what it must dedicate itself to achieve, to move ever closer to achieving the vision. Values are the non-negotiable beliefs an organization holds to deliver its mission. Each value should be backed up with explicit policies that are embedded in the way it does business. Brand is the promise of value represented by the sum of the vision, mission, values and expertise. It is conveyed through communications and behaviors. The most successful brands today shape a unique narrative. One that it is honest and true, and expresses a belief system that resonates with employees. Importantly, they reject generic corporate language and develop a unique story that could only be from that organization and none other. To be earth’s most customer-centric company, where customers can find and discover anything they might want to buy online. We strive to offer our customers the lowest possible prices, the best available selection, and the utmost convenience. You can see how these core tenets might be attractive to employees. Insist on the Highest Standards. Have Backbone; Disagree and Commit. 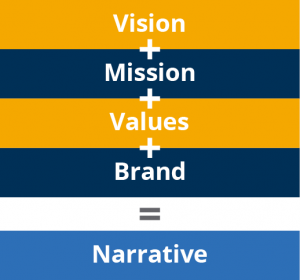 When Vision, Mission and Values are part of one fabric or narrative, they shape a brand that connects with current and prospective employees. The internal brand language at Amazon is “Work Hard. Have Fun. Make History.” The words “make history” point to the opportunity to do something big and important. It means more than money… it signals that customers can derive extraordinary value because Amazon exists. The truly great brands, large and small, spend a great deal of time focusing on their brands as the expression of the narrative. IBM has brilliantly picked up on the need for congruence. They focus more today on “creating a world that is fairer, more diverse, more tolerant, more just.” Think about that… their over-arching philosophy does not reference products and services, but summarizes what they believe. From a brand communications perspective, IBM links this idea to employees by speaking about “…a world we want to live in. The world you’re building…”. They make the connection for the employees so that they can see purpose in what they do every day. This is congruence at work. To the extent that a vision sets the stage for what millennials want to associate with, the company will attract the right people and develop greater levels of loyalty than their competitors. The challenge is to determine whether each element provides enough guidance to shape a congruent experience so that employees stay loyal and enthusiastic. As meaning and purpose evolve as the primary driver of attracting and retaining talent, the “Congruence Narrative” becomes the epicenter of the connections. If an organization creates a “Congruence Narrative” that resonates, just imagine how much easier many processes will become; from attracting the right talent, on-boarding, training, through internal communications, etc. CEO & C-Suite. This should be the core group responsible for the Vision. They should be focused on the future and where the organization needs to go. By understanding their key task, this will simplify the number of people and speed of the process. Often, involving more people tends to complicate the process, not help. Senior Leadership. This must be the wider team to articulate two things: 1) the Mission of the organization to achieve the Vision, and 2) the Values that drive behaviors. Involving the broader group not only develops these elements, but also generates critical alignment. Associates. Once a draft of the Vision, Mission and Values are developed, it is imperative to involve associates to validate that these elements resonate. Critical listening to feedback will inform and help modify to result in a narrative that truly engages the workforce of the future and develops high levels of loyalty. When done, you should have a brand that signals an organizations core reason for being, and clearly telegraphs the purpose and meaning employees are seeking. 1 Birdwell 1968; Bellenger, Steinberg, and Stanton 1976; Dolich 1968; Hughes and Guerrero 1971; Munson 1973; Sirgy 1980; Stern, Bush, and Hair 1977. Any brand that endures and stands out from the pack does so by connecting with a fundamental human need. Professional services firms, which deal with abstractions and intangibles, can begin to build and leverage this deep human connection by first understanding what they stand for – what they intend to mean to their clients and employees. A powerful, authentic brand captures and signals the underlying human meaning in your business – the thing that sets you apart and makes you matter to your marketplace of potential clients and recruits. Your brand is therefore a strategic business issue, way more profound than issues like name, logo, tagline, or visual style. Those are symbolic expressions of the brand, shortcuts to the meaning in the business: they are not the brand itself. One of the key challenges for a professional services firm is how to encourage clients to have a committed relationship to the organization, not just to the individual consultant. Brand offers a way to do this, by building a shared sense of the meaning in the business, while at the same time enabling individual professionals to express that meaning in a way that is authentic to them. Vision, values and beliefs drive the behaviors that convey the brand. Understanding and clarifying these areas is essential to building a meaningful professional services brand. Take McKinsey and The Boston Consulting Group (BCG), the top two global strategy consulting firms. They each recruit similar people from the same set of elite schools, and they each address similar business challenges with similar intellectual tools. And yet clients see real differences and make choices between the two. How and why? The answer lies in the meaning that both firms have built as they have developed their respective brands. McKinsey has come to mean power and control – the stability and order that enables prosperity. BCG on the other hand, has built its brand meaning around understanding and transformation – the insight that empowers you to change your circumstances for the better. Both are compelling meanings that speak to fundamental human needs, but each appeals to a different client mindset. These two iconic consulting brands have used narrative and story to create meaning and differentiation as they compete for clients and talent. Our next post will explore how to use story as a tool to differentiate your firm, and to create meaning that attracts the right clients and the right recruits. Why Can’t Everyone be like Ford?